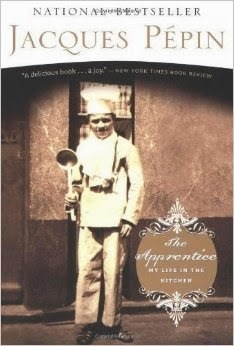 Our June/July book pick at Cook the Books has been Jacques Pepin's memoir "The Apprentice: My Life in the Kitchen". While I was familiar with Chef Pepin's smiling face, easygoing manner and uncomplicated, but awesomely tasty, recipes from his many appearances on public television cooking shows, I was not familiar with his personal story. "The Apprentice" tells his remarkable tale, from his childhood in France during the darkest days of World War II, his years of apprenticeships at various hotels and restaurants, his emigration to America and various experiences at fancy restaurants, and his remarkable friendships with Craig Claiborne, Julia Child, Pierre Franey, Howard Johnson, Barbara Kafka and James Beard. Through it all, his down-to-earth style and personal warmth shines through. I have always thought Pepin was an admirable TV chef because he never cops an haute cuisine attitude about cooking, but instead deconstructs recipes and techniques so that his audience can replicate the dishes he makes on screen. After reading his autobiography, I am even more impressed and endeared by his manner. Despite being a foodie superstar he always stresses the importance of cooking good food for your family and friends in order to share time and love with them, not show off. I am looking forward to trying Pepin's recipe for Smoked Trout a la Gloria, named after Madame Pepin, an expert angler who brings home fish for her husband to smoke in a roasting pan on the stove. Sounds delicious and while I am not the fisherman in the family, I am willing to smoke up the trout that Dan loves to catch. For my Cook the Books Pepin-inspired dish, I looked over the two dozen recipes that stud each chapter of this memoir. They were tempting, but I decided to create something with venison, in reference to the most harrowing incident related in the book: Pepin's nighttime car accident with a deer that left him with a broken back, two broken hips, a broken leg, cracked pelvis and a left arm that was so badly fractured that his surgeon considered amputating it. What an ordeal! But Pepin doesn't dwell on that incident, and segues into his subsequent experiences in teaching cooking classes, working with corporate clients and writing cookbooks. But I feel Jacques should have his revenge against that kamikaze deer with a venison dish, so I pulled some venison stew meat that we had in the freezer care of Dan's hunting cousin and put together a delicately seasoned venison stew. Pat venison dry with a paper towel. Mix flour with salt and pepper and dredge venison in this mixture. Heat 2 Tbsp. of oil in a heavy bottomed saucepan. Brown venison in batches over medium-high heat until browned on all sides and a nice crust forms. Remove and set aside. Add remaining 1 Tbsp. oil to pan along with celery and carrots. Cook five minutes, stirring occasionally. Add in potatoes and cook another five minutes. Add wine and bring to a boil. Return venison to pan. Cover and simmer until vegetables and venison are tender, about 30-35 minutes. Add herbs during the last two minutes of cooking. 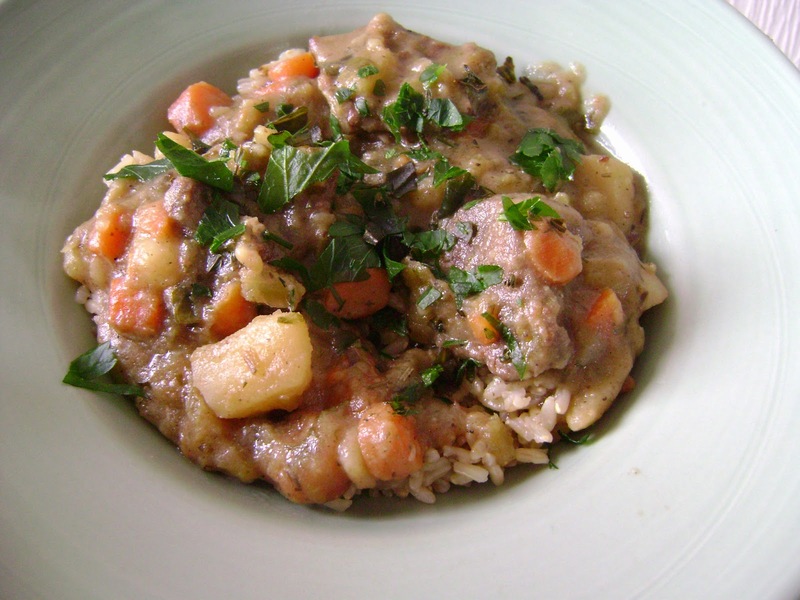 This is a very delicate, aromatic venison stew. A couple of turnips or parsnips would be nice additions in here too. Please join us after the July 31 deadline for Cook the Books to see the roundup of dishes inspired by our reading. I am also linking this post to Souper Sundays, a weekly celebration of soups, stews and sandwiches at Kahakai Kitchen. The next book selection at Cook the Books will be Marlena de Blasi's "1000 Days in Venice". Deb of Eliot Eats is hosting and notes that the book is one of her favorites. Submissions due September 30, 2014. Lovely review post as usual Rachel. I am glad you enjoyed the book. Re-reading it made me admire Pepin even more. Such a classy guy. I love the inspiration for your recipe and the stew definitely looks like a tasty revenge. ;-) Thanks for sharing it with Souper Sundays this week too. A delicious form of revenge Rachel, and work with various meats I'm sure. Great review and choice. Great idea with the venison and I just happen to have some in my freezer right now. I really enjoyed getting to know Jacques through his book also. How creative to revenge Jacques!! I just happen to have some venison in my freezer. I am anxious to try your recipe. Insure wish we could get venison here, well we could if we hunted....love that you used sorghum flour as we can't eat wheat. Lovely dish! Great post, Rachel and very nice recipe. I admit I am not a venison's fan, but I am sure it will taste good with other types of meat as well. I use sorghum flour quite a bit too.